Sick is quite a unique concept. I find it hard to categorize, and probably can't, without spoiling too much of it. The publisher's summary of the book probably does a pretty good job of covering it, so I won't just reiterate that. However, I'll say that it does go heavily into the area of spontaneous regeneration, an idea I do think about sometimes. I realize that modern medicine does mock stuff like that, but I still can't help but thinks the scientifically accepted fact that every cell in a person's body has enough information stored in it to, given the right conditions, generate a whole person. That is how we get from zygote to person... I also like the lead character, her whole character and job, situation, and life. It felt a unique idea, and overall well executed. When I saw the opportunity to get a free review copy of this from Audiobookblast, I noticed the author, and knew I recognized the name, but I just could not pick from where. I checked audible and saw that he was also the author of The Walking Dead novels. Although I don't have those books (I try to keep away from books centered around the bad guy, as the Governor books likely were), I was always tempted, being a fan of the Walking Dead comics and TV series. This book I believe was written back in the 90s (from mentions in the book, plus looking at the editions at Amazon), and just recently released on kindle and audio. It doesn't feels dated though. Julia Knippen's narration was enjoyable, and I had no issues distinguishing characters or following the story.. I don't have any other books performed by her in my library, but would definitely have no issues buying other books. This was a very... unusual read. Not bad-at all-the beginning started out slowly, but I feel that it was necessary for character development and a nice, slow buildup. I loved that different genres were traversed. It happens so very rarely that it's a wonderful surprise when it does. We started out with general fiction (learning about the current life and friends of our main characters, experiencing her day to day existence), seemingly predictable; then as disturbing events begin to occur, it goes into mystery quickly evolving into psychological thriller and then- once we reach the pinnacle of the story- true, unimaginable horror. You could easily break this book down into smaller books, if you find it slow going in the beginning. It's worth it, so just keep reading! There are several different story lines along with a different genre and feel about each one of them. I will absolutely read another book by this author (I did read the Walking Dead novels, but I'd love to see more unrelated to that series. I love it, but I loved this more.) The narrator did a wonderful job giving life to the characters and bringing about the different feelings evoked in the book and giving each character their own voice. With the book's direction for the dialogue scenes and the narrator's ability to fulfill the conversations better than I would be able to imagine on my own. I want more books from this author and I want them narrated by this narrator! She just works the characters into the story without making you give a second thought to what many narrators would make awkward or odd sounding. I could definitely see myself seeking her out as a narrator when browsing for books. (Not something I generally do- only for my top three narrators, which until this book, was only two). 1. Don't expect horror straight out of the gate. This book evolves through genres as our characters become more complex. 2. Hang in there- it is quite slow for quite awhile-but well worth it!! 3. Be ready for the horror when it does strike- and it will. Some of the imagery is much more graphic and twisted than anything I've ever seen in a movie or on tv. I received this book free of charge from the author, narrator or publisher in exchange for an unbiased review. Would you consider the audio edition of Sick to be better than the print version? What other book might you compare Sick to and why? I can not compare this.it is very unique! I have, she is always good! She did a great job with this book..I did not want to put it down! Who was the most memorable character of Sick and why? AWESOME STORY! I RECOMMEND!!! COULD NOT PUT IT DOWN! I was really interested when I saw this book by Jay Bonansinga. I was a big fan of his Walking Dead books and liked his writing style. This was an interesting idea for a story, but it kind fell flat with me. It took several hours to actually get into the story and it became a little frustrating. The writing was good and once the action starts the story gets much better. I had never listened to Julia Knippen before and thought she was great. The way she distinguishes between different characters made the novel much easier to understand. I will absolutely listen to her again. Medicine? See what i did there? Sick! Got it? Good! When a book from The Walking Dead: Rise of The Governor comes and make another book i am already interested! 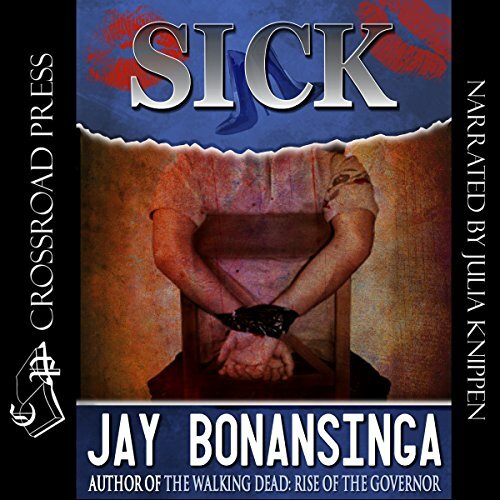 Sick is not Jay Bonansinga best book, Rise of The Governor is better! When that is said: This is not bad, not at all! This book I believe was written back in the 90s, and it feels like that is kind of a thing that dates this book! Not saying books that are in the 90's is not good, but i say it feels like this is his early work! Still: Get this book, it is that good! Julia Knippen is new for me, and it is a pleasant new meeting! She really invested her all into the characters and it shows! It is easy sometimes that a voice feels a bit monotone, but i can say with all my hart that Julia Knippen made me a fan of her! So i guess that is good, she brings something extra to her reading, and it always feels fresh even after 12 hrs and 45 mins! So good job! That was fun! This was a quite intense story. It does start out a little slow but the intensity builds. Sadly, I didn't connect with Sarah straight away. It took me well into 25% and maybe a bit longer, to get to like her. This may be due to the story going back and forth between the characters. Sarah is also difficult to read. She is strong and then yet not. Maybe she just really wants to be strong but that wasn't fully able to realize it with all that has happened in her life. I do like Henry, her therapist, but there again he seemed to do things that were not fully to character. Sarah finds out early in the book that she has a tumor that is inoperable. The strange thing about the tumor is the shape. This brings forth other questions when she sees the shape and is quite surprised. There are odd little moments like this one that add up and do not mean much to the reader but they do add up at the end. The narration by Julia Knippen was very good and kept the emotion palpable. And there is quite a lot of emotion in this, but especially as the story goes along. I was easily able to discern the different characters and their different quirks. Especially Sarah's. She really comes out of Julia, making her feel like a real person. As the intensity increases, the plot makes more and more sense. 40% in and I was totally engrossed and ready to find some bigger answers. Although up until then I was still feeling at arm's length, the connection with the characters and their issues was getting better and better. I started feeling for Sarah and what she was going through. At 87% a lot of this came together in an awfully horrible way. This was a lot to take in but it's worth it. I think this portion was particularly difficult to listen to because I may have skimmed this part. Horrifying in all its gory detail but explained so much about Sarah. The audio for this was spot on and the narration was fabulous. My one critique was about the very end. I wanted a little more about the characters. It does give enough but I would have loved more. The Wizard of Oz portions were also not totally my favorite but again they add to who Sarah is. In short: Horrifying but really interesting psychological thriller. Horror lovers will enjoy Jay's writing! Sarah is a an aging stripper. Some might feel sorry for her, but she loves her life. At least, she did until she discovers a growth that turns out to be an inoperable tumor. Sarah's life is suddenly coming to an end, but she is not the type of woman to just give up and accept her fate. She is a fighter and she decides to try to find a way to not only extend her life, but to save it. However, things rarely go the way people expect them too. She discovers that a cure is possible, but it comes with horrific consequences. Can Sarah survive the cure? Does she really want to? The narrator does a terrific job with this audiobook. She uses inflection and a wonderful sense for perfect pacing to keep the listener intrigued throughout this long audiobook. The narration deserves 5 out of 5 stars. I enjoyed the multiple twists and turns in this story. However there were parts which did seem to drag. Also, some parts were predictable, but I still enjoyed this audiobook. WHY would you use a narrator that mispronounces? What would have made Sick better? Has Sick turned you off from other books in this genre? What is the genre? sort of horror? What didn’t you like about Julia Knippen’s performance? She cannot read and was never corrected when she mispronounced words from beginning to end.